It’s no surprise that Copperleaf is growing and expanding. With the addition of new neighborhoods, new retail features and so much more. Let’s take a quick look at the newest additions and upcoming features in Copperleaf Community. As mentioned in our April 2018 newsletter, Copperleaf is excited to welcome two new neighborhoods to the community. These two new neighborhoods, the Maple Neighborhood and the Willow Neighborhood, will both feature homes from Richmond American Homes. The Maple Neighborhood will be located next to Mountain Vista Elementary School and is now selling. The Willow Neighborhood will be located just off Radcliffe and Himalaya and will offer Richmond’s popular Seasons home models. Willow is still in the planning stages. We will keep you posted as more new neighborhoods open at Copperleaf in the coming months. 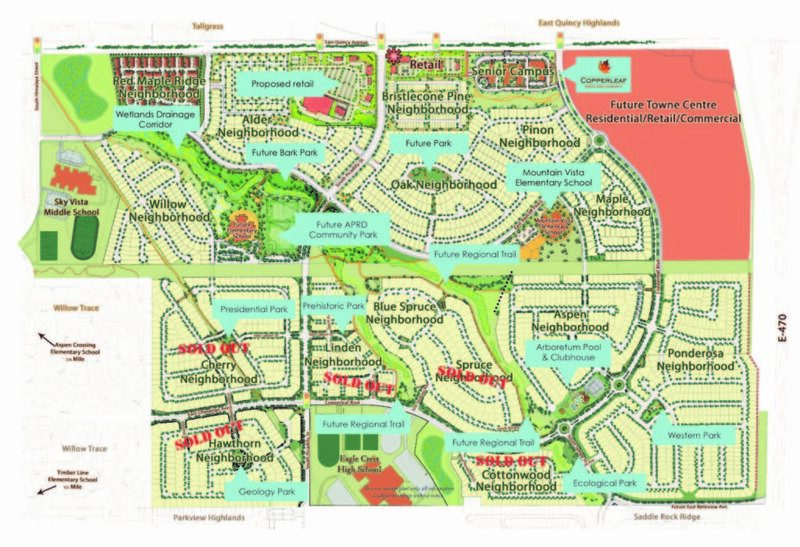 In addition to the new neighborhoods, Copperleaf is in negotiations with a variety of new builders. This means there could be new construction of the the remaining residential land in Copperleaf very soon which will include the construction of single family residences and perhaps townhome properties, as well. Keep an eye out for new developments as there is active construction all over Copperleaf. The much anticipated Copperleaf Bark Park is expected to be designed and built in the coming months with an estimated completion as early as 2019. The Bark Park planning and development will coincide with the extension of Radcliff Boulevard and will be located in the northwest quadrant of Copperleaf. Get your four-legged friends ready for fun canine amenities including a large off-leash area. The Copperleaf senior center – which will house multiple levels of senior housing, a nursing home and memory care facility – is slated to start construction this year with Phase 1 of the complex. This Senior Living Campus will be far greater than your average senior facility and will include high-tech amenities, concierge services, 5-star restaurants, a performing arts center and so much more. As some of you may have noticed, the new Maverik Convenience Store and Gas Station is now open at Quincy and Picadilly. This is the first retailer that has opened in our community and it features a delicious Cinnabon bakery. Stop in for a treat or to simply fill your tank. Further retail construction around Maverik is planned to begin in the fall. Additionally, Copperleaf is in negotiations with a variety of retailers and commercial property developers. Future retailers could potentially include a coffee shop and more. Stay tuned!. Yet again, we are hosting an amazing must-see summer event, Copperleaf Summer Jam 2018! This 4th annual outdoor concert festival will host the musical stylings of guitarist Eric Lane as well as performances by Raising Cane! This fun-for-the-whole-family event will also include yummy food trucks, family and kid-friendly activities as well as contests and giveaways. Join us August 12th from noon to 4pm in Copperleaf’s Western Park and experience the excitement that is Copperleaf Summer Jam! In addition to Copperleaf Summer Jam, Copperleaf neighborhoods will also be hosting community garage sales. Each neighborhood provides their own schedule, so keep a lookout on the Copperleaf Community HOA calendar for more info on dates and times. Other events and activities happening across Copperleaf include Active April, ice cream socials, popsicle parties, barbecues, pool parties, game nights, as well as multitude of wellness and fitness classes. If you have any questions or are interested in learning more about the developments happening in Copperleaf, contact us today or check out the Summer Activities Schedule for Copperleaf residents from the Copperleaf HOA .